Killer Characters: Going to the Mainsail Art Festival! #BOOKGIVEAWAY! Going to the Mainsail Art Festival! #BOOKGIVEAWAY! 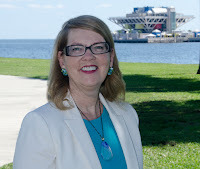 Hi there, I’m Savannah Webb, owner of Webb’s Glass Shop on Central Avenue in St. Petersburg, Florida. 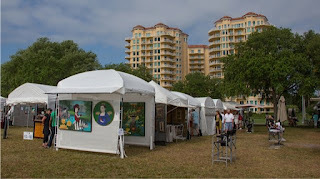 I'm planning to visit the Mainsail Art Festival on Sunday afternoon. This long-running event marks the end of our glorious winter season and the beginning of the hot days of summer. Mainsail Art Festival started in 1976 when the city's Bicentennial Committee, the Saint Petersburg Recreation Department and the new Saint Petersburg Arts Commission joined forces to sponsor the "First Annual Saint Petersburg Sidewalk Arts and Colonial Crafts Festival." For the second show, the name was shortened. "Mainsail" was chosen in 1977 to convey the event's importance, its excitement and marina setting on the waterfront South Straub Park. This year marks the 42nd Anniversary of the festival. 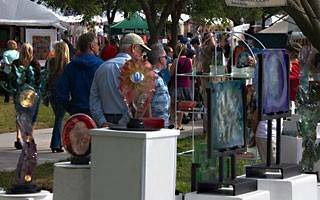 More than 100,000 visitors come to enjoy and purchase quality art and enjoy top name entertainment. The Mainsail committee of hard-working volunteers produces this festival exhibiting artists competing for $60,000 in prize money. Mainsail will be held on Saturday 9AM - 6PM and Sunday 10AM - 5PM. The weather forecast is perfect. Sunny, but cool with low humidity. I hope to see you there! There's a #BOOKGIVEAWAY! Leave a comment and your email address in the form of name(AT)server(DOT)com to avoid the SPAM bots. Do this by midnight on April 25 for the chance to win a signed copy of your choice of Pane and Suffering, Shards of Murder, or Cracked to Death. This giveaway is open to U.S. residents only. Winner will be notified within 48 hours after giveaway closes. Thanks, Lisa. Good Luck to you. I love Treasure Island. We've enjoyed many, many beach walks out there. Good Luck to you. Good Luck to you, Marilyn. Thanks, Autumn. Good Luck in the drawing. I love the glass arts, too. Good Luck in the drawing. St. Petersburg, Florida, is a hub for all things glass. Good Luck in the drawing. Just made a new pair of earrings this week. Needed a pair with some green in it. Good Luck in the drawing. This is an interesting series (especially since I'm having some custom panels made for my bedroom light). I'd love to add this book to my rather large home library. Stained Glass panels are featured in the first book in the series. Good Luck! Thanks! Good luck in the giveaway. Great series! I enjoyed all three. So very nice to hear. Thanks! I love the series, but I missed Pane and Suffering, so I'm hoping to win it! Thanks. I'm also trying to reduce things -- except books. Good luck to you. Congratulations, Annette! We've made contact and I'll be sending you SHARDS OF MURDER. Yay! That sounds very interesting. I have never read this series, but have been wanting to for a while. Thank you so much for the chance to win! I stopped by your fun blog today. I love giveaways. I have not read this series before but am looking forward to doing so after reading the review! Looks like a fun series. You are a new author to me, would love the chance to win! mariemcnary(at)gmail(dot)com. It's a fun series to write as well. Good luck! The festival is getting huge. It takes more than an hour to skim through the exhibits. Good luck to you! That's very helpful to beginning authors. Good luck! Really enjoyed the description of the book. I admire people who work with glass, it's really intimidating to me. Once you get some training, the glass isn't threatening. Good Luck in the giveaway. Fun series - thanks for the chance to win a copy of the latest. It IS fun to work with glass and write as well. Good Luck! I'm really enjoying your series and looking forward to reading Cracked to Death! Thanks so much for letting me know. Good Luck in the giveaway! Yay! You're entered. Good Luck! I love this series. When will a new book come out? I would love a signed copy of one of your books. I love books set in FL as we lived there for 17 years. Thanks for the giveaway. I love the premise of this series- how fun! Series I really want to read. Topic sounds very interesting. So this is a real festival....Mainsail? Sure wish I lived closer. Thank you for the chance to win a copy of one of your titles. These books sound like a lot of fun. Can not wait to read them. 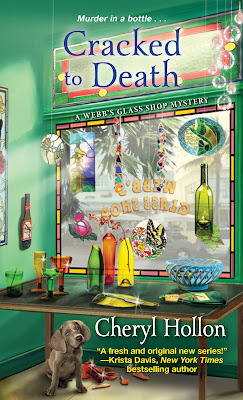 I've really been getting into cozy mysteries in the last few months! This looks like one that I'd enjoy. Thanks for the chance to win. I love this book synopses...can't wait to read and get into this series. I haven't read this series yet but it sounds great. Please enter me.